If you have a question about your water service or water meter this is a great place to start. How they work, links to the fee structure, ecoder checkup, what to do if something goes wrong, and frequently asked questions. It is essentially your water meter status. Your meter records a few usage statistics that can be useful in determining problems with your water service. These statistics are referred to by the manufacturer as Ecoder Data. The statistics it keeps are: Consecutive days with zero consumption, days of intermittent leak, days of continuous leak, the severity of reverse flow events. You must locate your physical water meter: they are typically found where the water service enters the building. You will need a flashlight or other directional light source. Shine the light on the clear plastic lens of the meter and observe the digital display. The Meter will display information in sequence, showing some information similar to a date, and then displaying the current meter reading registered in litres (for 5/8 and 3/4 meters). Litres can be converted to Cubic Meters by dividing by 1000. Use the Lookup Utility below to retrieve the latest ecoder data for your water meter. If your status shows a leak, check your taps and toilets for leaks and repair as soon as possible. For a water emergency please contact public works at 807-727-2597. 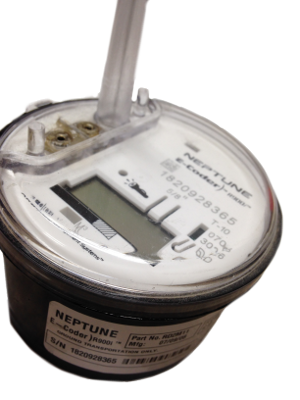 Information on how and when meters are billed contact Municipal Office at 807-735-2096.